Massimiliano Allegri has highlighted Paulo Dybala as the essential cog in ensuring Juventus' star-studded attack runs smoothly. Having scored 26 times in all competitions last term, Dybala's output has diminished since Cristiano Ronaldo arrived to become the team's new focal point. The Argentina forward has managed just two goals in Serie A this term with Ronaldo and Mario Mandzukic, who landed the decisive blow in the 1-0 Champions League win over Valencia in midweek, combining for 15. 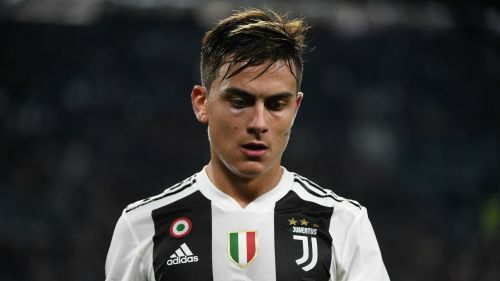 Allegri was pleased with how his front three functioned and reserved particular praise for Dybala, the 25-year-old having found the net four times in Europe, including a hat-trick at home against Young Boys. "If you find the chemistry between players everything is great and football is easy," the Bianconeri boss said. "The team played very well on Tuesday and the three at the front did extremely well. Mandzukic, Cristiano Ronaldo and Dybala. "It is true he [Dybala] is scoring less, but on the other hand he is linking midfielders and strikers and above all he takes us all out of trouble with his skills. "He is growing a lot from this point of view and for us he is very important because then the team benefits from him. "I have always said that with his talent in some games he can be a box-to-box player because he can finish off the play. "He has had many chances to score since the beginning of the season. He hasn't scored much compared to last season, but he is pivotal for our game." Juve's victory against Valencia confirmed their progression to the Champions League knockout rounds and established a three-game winning streak leading into Saturday's trip to Fiorentina. Allegri confirmed Federico Bernardeschi is fit to return from a muscle problem as the Serie A leaders seek to extend their eight-point advantage at the summit. "We have to keep raising the bar and demanding more of ourselves each and every day," he said. "Everything has gone well so far but we must remain level-headed and not get carried away by the good results."